Historical scale models, prizes, entertainment, activities, food, drinks etc. AN EVENT OF THE ROTARY CLUB OF KINCUMBER SHIPBUILDERS MEMORIAL PROJECT AND HISTORY & HERITAGE, HUNTER TO HAWKESBURY RESEARCH. A special History Ferry Tour departs Central Wharf, Davistown right where the keel for Pat Cam was cut. Tour concludes 11.30am at the historic Palermo shipyard, Daleys Point, where the Pat Cam was built by Gordon Beattie, returning to Davistown at 11.45am. The ferry is equipped with a large A/V monitor and will display a graphics presentation along with live commentary. Cost: $35 - Proceeds to the Patricia Cam Project and other historical projects. An informal Lunch at Davistown RSL Club, 19 Murna Rd. Davistown. Cost: at your own expense, RSVP by 15/1/18. to determIne numbers. Bookings to Graeme Davies phone: (02) 4384 5572 or 0416 276 363 or email gradav@ozemail.com.au. If numbers are sufficient, a room will be booked and special mentions will be made of service and civilian personnel aboard Patrica Cam, on 22 January 1943. Also the Beattie and the Cam families importance to NSW Central Coast’s Brisbane Water heritage and its once thriving shipbuilding industry. will become part of the Rotary Club of Kincumber’s Shipbuilders Memorial. Thank you to Mitre 10 Kincumber for supplying and erecting marquees and Daleys Kitchen Cafe who will stay open especially for afternoon tea after the unveiling (at your own expense). https://daleyskitchen.com.au. MONDAY - 22nd January,- Sunset, Last Post Ceremony at the Australian War Memorial, Canberra, in commemoration of the Patrica Cam. The story begins about 35 kms by sea, north of the Sydney Harbour, on the NSW Central Coast’s Brisbane Water. In 1940, at his shipyard, Palermo, Daleys Point, Gordon Beattie launched a vessel he constructed for Cam and Sons Pty Ltd of Pyrmont. The vessel was named Patricia Cam and registered as a collier, it operated between Lake Macquarie and Sydney. Pat Cam had a career change after Japan entered WWII, in 1942, being requisitioned by the Royal Australian Navy and stationed at Darwin as a general purpose vessel. The story comes to an abrupt end on the 22 January 1943 when en-route to supply Australian Coast Watchers, Pat Cam, was attacked and sunk by a Japanese sea-plane. The story gains a new life when Mike Owen and other dedicated Territorians found a ships knee, believed to be from Pat Cam. They then had a Commemoration Plaque placed in Eastern Arnhem Land near the site of the sinking. 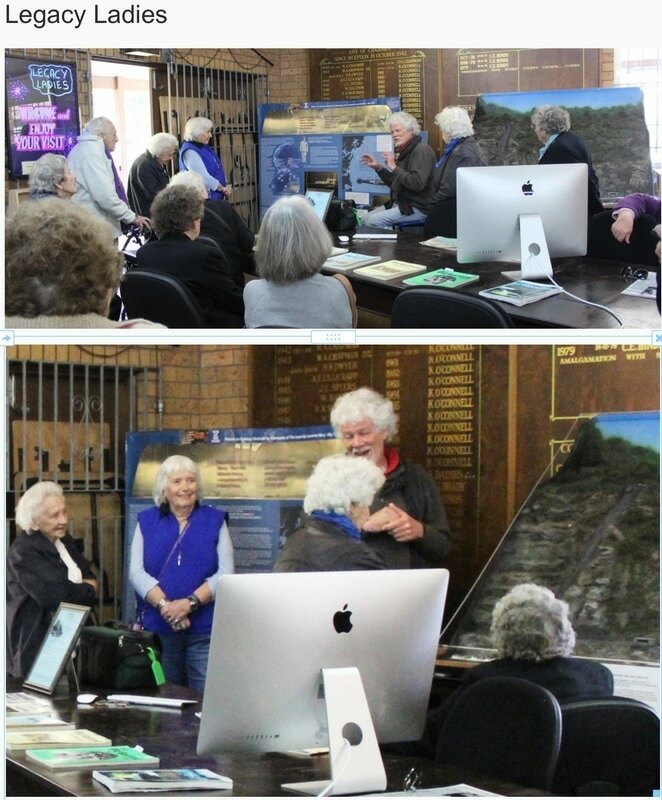 Meanwhile around the Brisbane Water NSW, a group of historians, retired maritime professionals, and artisans commenced the planning and building of a 1:50 scale model of Pat Cam. HMAS Hawkesbury I - WWII Frigate the first ship named after the river that forms the Central Coast southern border. HMAS Sydney - another part of Australia’s first naval fleet. SMS Emden - part of the German East Asia Squadron which opposed the Australian navy in the Pacific and Indian Ocean in 1914/15. This ship was engaged by HMAS Sydney in Australia’s first naval action. Patricia Cam built in 1940 at Palermo Yard Daleys Point and sunk by the Japanese near Darwin in 1942. Local historian Peter Rea will be coming in to discuss his incredible submarine display, as well as how he became so interested in local history and models. An entertaining and informative session with plenty of time for questions and​ answers! The display is at the library from August 2016 for 2 months. On history of Hawkesbury River/Broken Bay history. warships HMAS Parramatta and HMAS Swan. key role with the 'West Head Awareness Team' WHAT'. GCC Award in 2015. Mention in Parliament. Following the regional Anzac March in Gosford, 4HR will participate in an exhibition in the corporate lounge at Central Coast Stadium, from 11am to 1pm. On display will be models of HMAS Swan and HMAS Sydney and related information and historic photographs. Form April 20 to April 27 at the Breakers Country Club, Wamberal. 4HR will join other exhibitors. 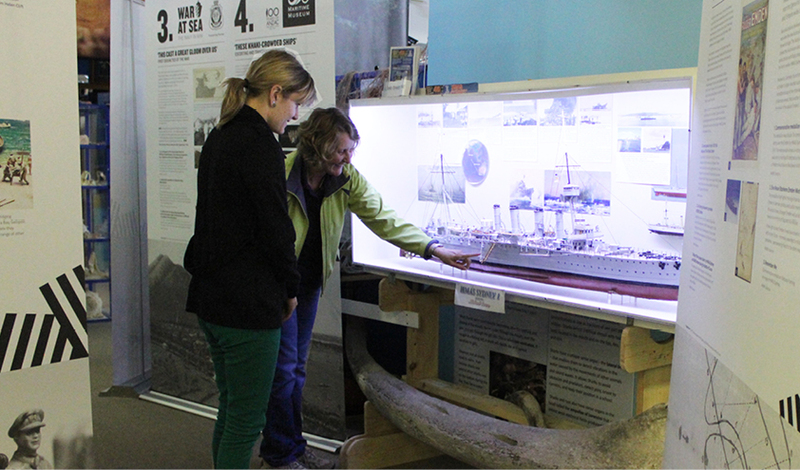 Most of 4HR's projects will be on display; West Head Battery, Submarines Off The Coast, HMAS Swan and HMAS Sydney. HMAS Swan, Hawkesbury River warship wreck model and graphics. Sydney Submarine Attack-1942, 11 detailed scale models and specially prepared graphics tell the story. West Head Battery, newly completed and the first time on public display is this model of this historic Broken Bay site. Complete with a ﻿working﻿ inclined railway! Which was the biggest ship with the biggest guns? ​HMAS Swan, Hawkesbury River warship wreck model and graphics. Venue: Wyong RSL Club 10.30 am. Email: jkfearon@iinet.net.au or email 4HR via 'CONTACT US' this page. 4HR TAKES ON A MAJOR ROLE IN A NEW REGIONAL TOURISM PUSH. In conjunction with the Central Coast Inter-Active War Museum, 4HR invited 40 people from Local Government, the tourism Industry and various aspects of local History/Heritage to a dinner/networking/strategy night. The Central Coast Marine Discovery Centre, Terrigal is currently hosting an exhibition from the Australian Maritime Museum (AMM) regarding Australia’s Naval involvement in WWI. This exhibition is part of the Anzac Centenary Commemoration. 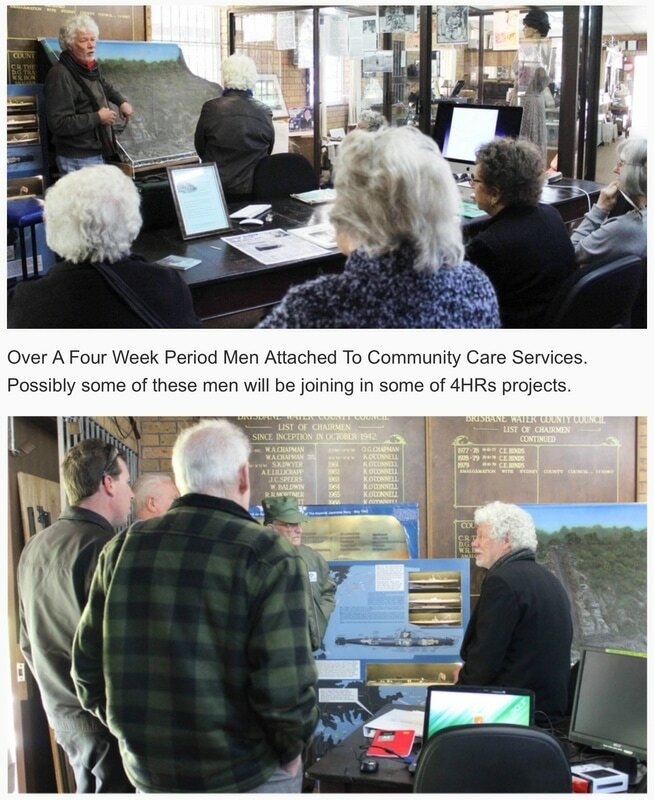 Recently additional exhibition pieces and graphics have been added by the local group ‘History and Heritage, Hunter to Hawkesbury Research’ (4HR). This material includes a finely detailed 1:350 scale model of the German ship Emden and two specially commissioned large scale models of the historic Australian ships HMAS Sydney I and HMAS Swan I. The wreck of the Swan today lays in the Hawkesbury River. The graphics on display have been specially designed to enhance each model. 4HR's models of HMAS Swan, HMAS Sydney, SMS Emden and associated graphics will be on display at the Central Coast Marine Discovery Centre (CCMDC) for a few weeks from Sunday, 24 May 2015. This will support an Australian Maritime Museum exhibition currently at the CCMDC. 4HR will also be providing a public presentation at the CCMDC (date TBA). The 4HR models and some of the graphics will then go on loan to Henry Kendall Cottage & Museum where 4HR will have a representative most Wednesdays & Sundays. Leave your details via 'CONTACT US' and we will provide a date for the CCMDC presentation when it is finalised. at the Kincumber School of Arts Hall 'Rescuing the Past' event…. Central Coast Family History Society Inc. Founding announced from Federal Anzac Centenary Grant, to cover materials for building a number of exhibition subjects relating to WWI. 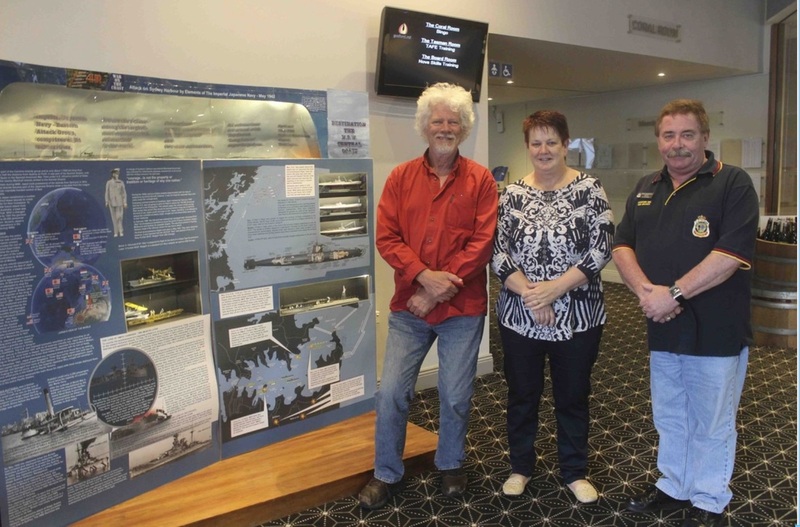 Sydney Japanese Submarine Attack May 1942 display at West Gosford RSL for Anzac 2014 - Peter Rea, Patsy Edwards, Greg Mawson.